This stick just realesed about a month ago and I picked up a box from ccom off their black friday deal. I've smoked a total of 3 of these cigar, and I can honestly say - It is my number 1 favorite cigar. I haven't noticed a thing on the forums about them yet and I wanted to try and bring them to the light for people to try because I don't believe you'll be disappointed! 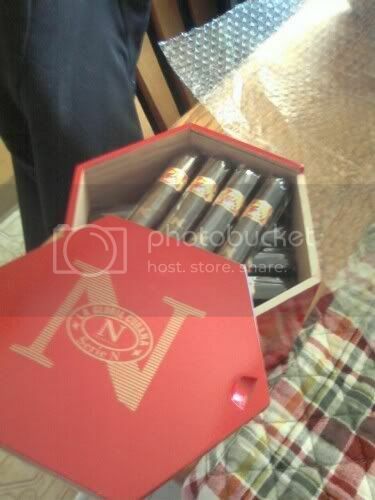 It's "Serie N" for the large amounts of Nicaraguan tobacco in it which La gloria claims makes it a full bodied cigar but you may be suprised to find how mild-medium and smooth it is, also how it gets stronger the longer you smoke. Also, It's a maduro, which If I know any of my fellow Borks, that right there just sold you. If anyone is really curious I'll write up a review for it, but for now I'll throw this line out and hope to snag a few of you into picking one up and trying it. Oh, P.s. It shows a lot in my love for this cigar for me to say it's my number 1, because..... I may be the only person in the world but.... I don't like maduros. I've always loved the way La Gloria Cubana sticks look... I saw a Series R in my B&M once, and my first thought was "Damn - THAT is what a cigar looks like". BTW, you coming to the Casino herf in January bud? I saw a Series R in my B&M once, and my first thought was "Damn - THAT is what a cigar looks like". Yeah dude, couldn't have said it any better. I've been a fan of the original sumatra LGC for a while, but actually just had my first Series R a few weeks ago with my Father in law. Really impressed with it. Both the original and the series R are just no frills, no nonsense, real good cigars. Haven't had the series N yet, but I'm gonna have to change that soon. Saturday January 15th at noon. i have one in my humidor. i have high hopes for it. it just needs some rest. I have to tell you, DD, I was actually expecting more power from this stick too considering it is a Nicaraguan puro - but from what I've heard form other people that have had it too, it's not a very strong stick. I think they advertised it incorrectly and instead of going off the body strength try going off the flavor strength. Honestly, the LGC brand is probably the only one that General produces that I really like. There are a few GC Hoyos that are okay, but really the LGC is the only thing that does it for me. Ernesto Carillo really did great things for that brand. His personal brand is awesome too.